How much of your freelancing work are you willing to redo? If you’re like me, you don’t like unnecessary rework. It eats into your time and cuts away at your profits. But if you don’t back your freelancing work up on a regular basis, you could wind up having to do a lot of rework. In fact, the list of what you could lose could go on and on if you don’t regularly back up your work. In this post, I’ll identify seven serious problems that could cause you to lose your data. I’ll also discuss several options for backing up your data. If you liked this post, you may also like 10+ Features for the Freelancer’s Ideal Home Office. If you’ve never had any problems that resulted in data loss, it’s easy to think that backing up your data is a waste of time and money. After all, equipment problems are what happens to the other guy, right? Computer crash. Eventually your computer will wear out. Or the hardware may be defective. Either way, if you rely only on your computer to store information, you’re in trouble. Power outage. You should have a surge protector attached to your computer to keep power outages from frying your machine. Even if your data isn’t compromised, you may want to access it while the power’s off. Computer virus. A computer virus can destroy data and trash your hard drive. Of course, you should have virus protection software installed, but even with that your machine could still become infected. Natural disaster. 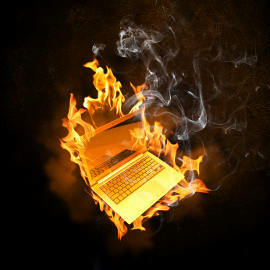 I hope it never happens to you, but would you be able to access your data if your house burnt down with your computer in it? What if there were a flood? Cyber attack. Hackers are becoming a bigger and bigger problem. Even large companies with elaborate security systems have had their business data compromised. Theft. Again, no one wants to think about this, but if a thief takes your computer are they also taking your freelancing business? If all of your business information resides only on your compter, it would be gone. Accidents. The one thing about accidents is that they do happen. You could accidentally drop something on your hard drive or knock it off your desk. Computers can still be broken. You may not anticipate any problems, but that doesn’t mean they won’t happen anyway. As the saying goes, “what can go wrong will go wrong.” It’s best to be prepared. New freelancers, in particular, tend to overlook the need for backups. Subscription backup service. Probably the easiest way to back up data is by subscribing to an online backup service. Many backup services use the cloud to store your data, but some may store it on their own servers. Two examples of subscription backup services are Mozy and IDrive. For a more complete list of 27 backup services, check out Tim Fisher’s post at About.com PC Support. Physical devices. Another way to back up your freelance business information is by using a physical device. Some examples of physical devices include external drives and even flash drives. If you do decide to back up your information on a physical device, remember that ideally the device should be located away from your main computer. Otherwise, your backup device could be lost in a physical disaster along with your main computer. Software backups. Many software programs can be set to automatically back up your work periodically during the day. While this won’t help you in the event of a major problem, it could keep you from losing a day’s work if your power went out and you forgot to save your work before the outage. The best thing to do is study several options for backing up your work so that you can find the best one for your budget and needs. What is your preferred method of backing up your freelancing work? Share your favorite tools in the comments.